Yankee Stadium is the iconic home of baseball side New York Yankees and is arguably one of the best known stadiums in the world. On April 21st 2014 it was announced that New York City FC would play their home matches here until their new soccer stadium is completed. The current iteration of Yankee Stadium first opened on 3rd April 2009 with an exhibition baseball match between the Yankees and Chicago Cubs. Costing an estimated $2.3 billion with over $1.2 billion contributed through public subsidies. Taking over three years to build, the desire for the iconic baseball team to move to new facilities emerged as far back as the 1980s. Designed by sports Architectural firm Populous, the new version of the Yankee Stadium was designed to closely resemble the appearance of the original 1923 stadium with the exterior made through extensive use of Indiana limestone, granite and pre-cast concrete. On the inside, the stands mirror the original seating arrangement however comfort levels are in line with modern stadia, capable of seating just under 50,000. 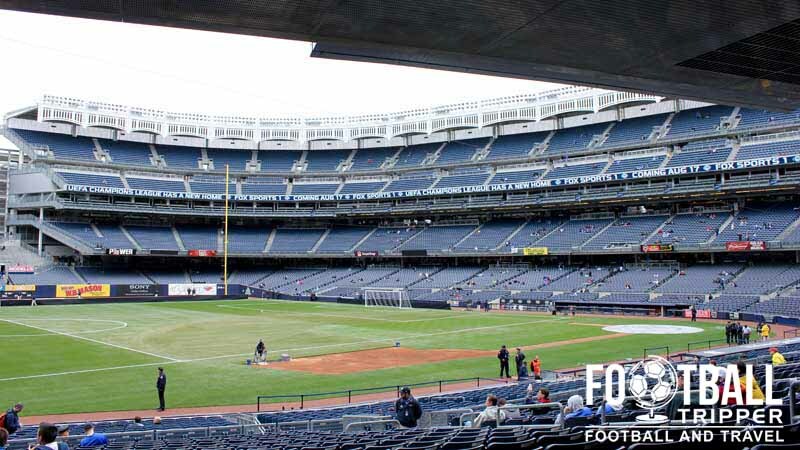 Although the designers Populous have previously built multi-purpose soccer stadiums such as England’s Wembley, and Arsenal’s Emirates, The Yankee Stadium is very much designed to just play baseball matches. 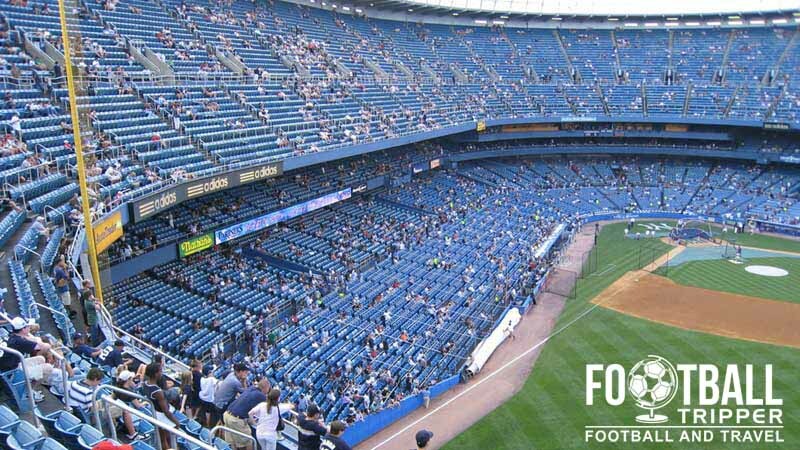 This means that the rectangular playing pitch required for soccer only just about fits inside the dimensions of the baseball field, with the distance created between some sections of the crowd comparable to Olympic stadiums. 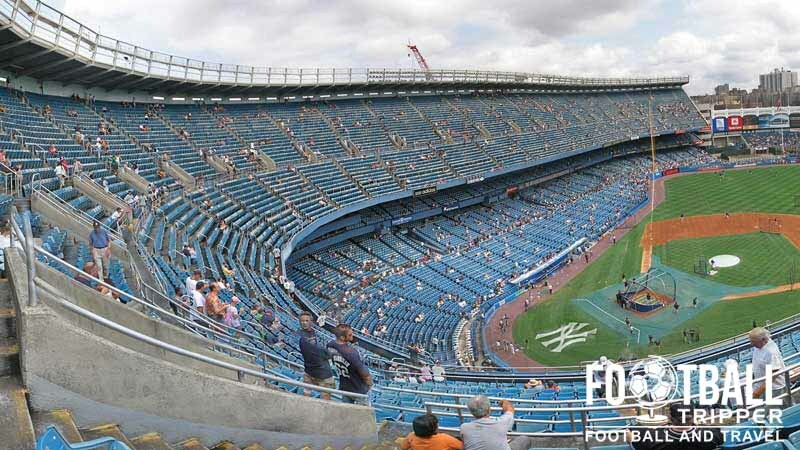 The first football match held at Yankee Stadium was part of the World Football Challenge between Chelsea and Paris Saint German on July 22nd 2012, and a month later A.C Milan took on Real Madrid with each game attracting 38,202 and 49,474 fans respectively. 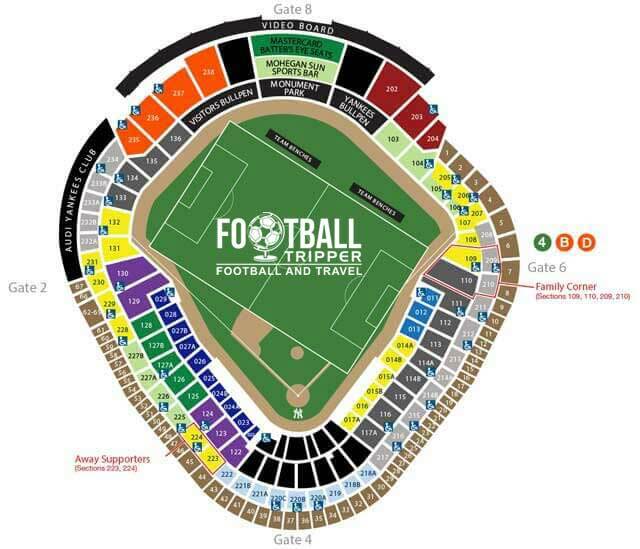 Attendees for New York City F.C’s inaugural season are however expected to be just over half of the one-off friendlies, with the capacity scaled down to 27,470 by default. At this moment in time, the 2015 established franchise haven’t got the same pulling power as one-off European Soccer Friendlies, however expect things to change when the club move to a purpose-built ground at the Bronx in 2018. Images of each stand are coming soon. Supporters of the oppositions team are primarily housed within sections 223 and 224 of the stadium, however as is customary in US sports fans of both sides are likely to sit together in other sections of the ground. The club have currently teamed up with numerous pubs throughout New York to guarantee that New York City’s matches are shown live on TV with sound. For a complete list please check out this pub page. Once you get to the Yankee Stadium there are loads of points where you can purchase a beer or soft drink from. New York is famous for its diverse culinary options and inside the Yankee Stadium this is certainly reflected with fans served a vast array of dining options. Of course classic stadium fare such as hot dogs, hamburgers and popcorn all remain staple items on sale. As NYC FC are newly established it doesn’t appear as if the club have set up a permanent shop just yet, however you can purchase merchandise from various kiosks on match days as well as online via the club’s official store. A healthy supply of New York City FC Merchandise has begun to circulate throughout the five borroughs. 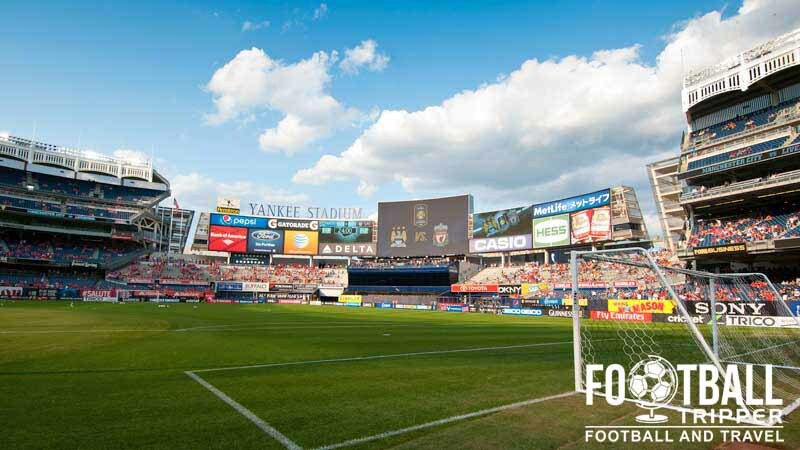 Although there may be a Baseball tour of the Yankee Stadium, currently New York City do not offer soccer fans the chance to see the various facilities first hand, however expect this to change when the club finally moved into their new purpose-built stadium in a few years. For now you can make do with this Virtual Venue Tour. Fans wishing to watch New York City F.C in action during their inaugural season can purchase tickets online from the official Ticketmaster page which is the clubs preferred ticket vendor. All prices are listed as illustrative subject and are subject to service fees which can add $5.00 or so on to the total price. Yankee Stadium is situated on One East 161st Street within the Bronx which is the northernmost of the five New York boroughs. The exterior of the iconic Yankee Stadium as see from across the road. Like any major city driving in New York is notoriously chaotic due to the large amounts of congestion, however the parking situation could be a lot worse with the existence of 10 or so parking lots near to the ground. The three largest garages fans can use on matchdays are Ruppert Plaza, East 161 Street, and 153 Street, although it’s still advisable that you get there early to avoid stress. There is a special Metro-North train service which connects the stadium to the rest of New York during matchdays. Known as the Train To The game service, it is one of the most popular ways of travelling to the Yankee Baseball field on gamedays. Both the 4 (East Side) and D Train (Sixth Avenue) make stops at the 161st Street/Yankee Stadium subway stations which are the closest to the ground. If you are travelling during the week the B Train is also a possibility, however most soccer matches are played on weekends. 161 Street – Yankee Stadium Station is one of the easiest ways to travel to the stadium on matchdays. The baseball stadium is serviced by many bus routes including the Bx6 and Bx13 buses which stop at East 161st Street and River Avenue which drops fans of the closest to the ground. There’s also the Bx1 and Bx2 bus routes which stop slightly further away on East 161st Street and Grand Concourse, although this is still very much walkable. For further information on any of the above public transport options please visit the Metropolitan Transportation Authority’s website by clicking here. The two closest hotels to the stadium are probably the Howard Johnson Inn or Days Inn Bronx, although to be honest there aren’t too many options immediately within the vicinity of Yankee Stadium. With the vast metro system on hand and a whole city to explore you shouldn’t limit yourself to any particular area.